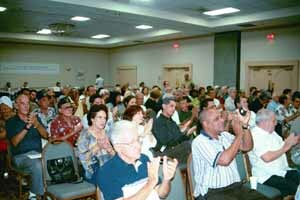 Leonard Weinglass (top) addressed a meeting of more than 150 on the case of the Cuban Five in Miami September 14. The Alianza Martiana organized the event to commemorate the fifth anniversary of the arrest of the five Cuban revolutionaries. 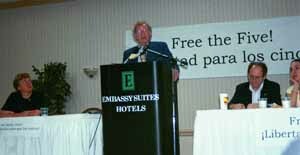 Weinglass urged participants (bottom) to popularize the facts in this case. He noted their appeal may be heard in Miami at the beginning of 2004. Antonio Maceo Brigade leader Andrés Gomez read a statement from the families of the five imprisoned Cubans, thanking the participants.